With a significant innovation for interior masonry fencing, Proto IITM offers the perfect masonry alternative to low cost, inferior vinyl or wood fences in interior B@100 applications. The safety, durability, and marketability of a masonry fence at a price competitive with vinyl. 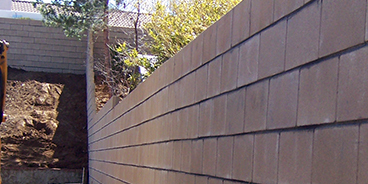 By utilizing a stocked, off-the-shelf 4-inch wide concrete block in stocked gray and neutral tan colors, similar to vinyl availability, Proto II installers can harness the efficiency of Proto II post-tension to deliver an interior lot-separation masonry fence competitive with vinyl fencing. Wherever vinyl or wood fencing is used. B@100, typically interior lot separation walls. Continuous trench design accommodates property line conditions. Professionally engineered to provide the durability and wind resistance equivalent to wall 6-inches and more in width. Far superior to vinyl in durability, safety, and markebility. Long-term benefit to the homeowner. 4x8x16 Proto II Tongue & Groove cmu pecision Normal Weight unit stocked in natural Gray and Proto Tan colors.